This page provides you with Journalism resume samples that you can use for inspiration in writing your own resume, or for creating one through our easy-to-use resume builder. Below you'll find our how-to section that will guide you through each section of a Journalism resume. Journalism is a cutthroat industry. As a journalist, you will be in constant competition with other reporters and media organizations, always on the hunt for big scoops, interesting assignments, and prestigious bylines. The competition for journalist positions is similarly cutthroat. When applying for a job you will need a resume that quickly and effectively captures the attention of hiring managers. There’s no doubt you are great at writing, that’s your life, work and passion, although writing the best resume requires additional skills that you must use in order to convince the recruiter that you are the one! Our journalist resume sample have helped many of your colleague securing that dream job they have wanted for years: why don’t you let us inspire you as well? With VisualCV you can create professional, eye-catching resumes that showcase your skills and feature a portfolio of writing samples and articles you have previously written. 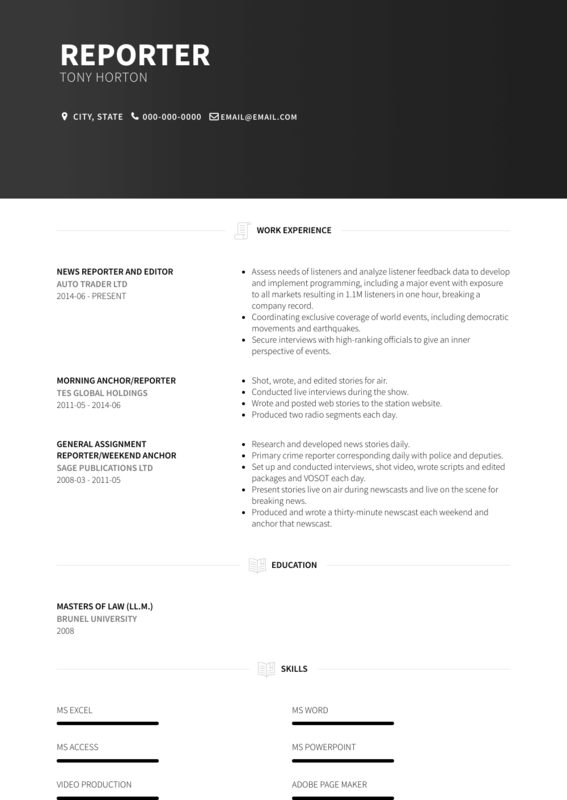 How to Write Journalist Resume? Journalism as a profession requires logical and concise writing, and your resume should reflect this. Much like the stories you write in your capacity as a journalist, your resume should have clear prose and a compelling narrative. Use your resume to show how you have worked your way to your current role. Your work experience should be written in reverse-chronological order, beginning with your most recent position and working backwards. Carefully curate the details that you share in your resume, choosing only those which showcase your marketable abilities. As strong editing skills and a close attention to detail will be expected of you as a journalist, be sure that your resume is easy to navigate and contains no errors or typos. Last, but not least: most recruiters require a portfolio of writing samples from previous assignments. Oh, and make sure you do not save your resume as a .doc file. Unfortunately Microsoft Word is evil and more often than not, it changes your layout. Please save it as a .pdf! Your Work History should tell the story of your career path. This section is where you can detail your past employment, including your achievements, skills, and responsibilities. Don’t be shy, you know you have been working hard on building your career, so please don’t sell yourself short and let’s convince your future employer that you are the one! Grammar, spelling and punctuation please! Write a tedious list of obligations from previous roles. For more tips on writing the best work experience section for a fantastic software engineer like you, check out our detailed resume guide. Though there are rare occasions where journalists break into the industry without it, some educational credentials will be an enormous asset to your journalism resume. Many academic institutions offer bachelor’s degrees in journalism, although related degrees in things like communications or political science can also be an asset, depending on your reporting specialty. For each item in your education section, list the name of the institution, the degree that you earned there, and the years you attended. If you can think of any relevant awards you received or special projects you participated in, feel free to note them as well. A great cover letter has never hurt anyone! Match a brief one-pager with your resume will give you an advantage over other candidates. Follow our tips here. We really like you, so here’s some additional tips for your best journalist resume! Make sure your resume doesn’t reach the 3rd page! Say you can use Microsoft Word: really? Finally, if you are looking for the best journalist resume templates, you should check these masterpieces we have been working on here : many professionals like you have successfully used them to take their career to the next level.